Porsche presented its remarkable model the Cayman GT4 2015 featuring a thrashing amalgamation of best performers ever created by company. 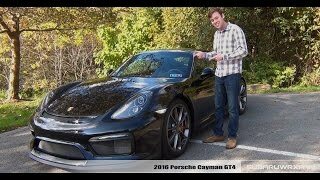 The Porsche Cayman GT4 2015 holds it’s widely spread roots in spectacular models like, 911 GT3, Carrera GT and 918 Spyder. Sounds little hard but Porsche has done its work impeccably. Let us scroll down and learn more about this newly unveiled model. The interior of Porsche Cayman GT4 2015 comes down the lane with the standard features. The interior has been given tiny bit of sports trim, like the leather and Alcantara upholstered sport seats which comes with an option to switch for bucket seats made from pure carbon-fiber. The dashboard is mounted by a small sport three spoke steering wheel with Porsche logo in between. Apart from this, company also provides its buyers Sport Chrono Package, which in the recent past brought a digital and analogue performance display. A button to enhance the performance ‘Sport Plus’ and more of racing oriented features and a Track Precision App, giving it a track oriented interior. The Porsche Cayman GT4 2015 exterior is indeed a step ahead than rest of its GT ancestors. A chin spoiler and larger air inlets get a place in front bumper adding to increased downforce. 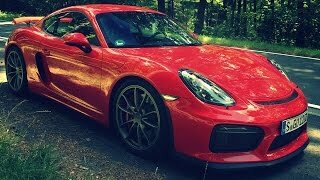 The riding height of Porsche Cayman GT4 has been dropped a little to add more to a performance oriented track experience while for looks, large rear spoiler is an appreciable addition. 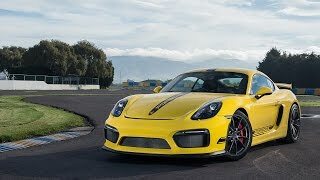 The Porsche Cayman GT4 2015 gets its power through a 911 Carrera S inspired 3.8 liter flat six engine producing 385 hp giving the model power enough to reach the top speed of 183 mph while finishing the 0-62 mph (0-100 km h) in just 4.4 seconds. The Porsche Cayman GT4 2015 price stands at $84,600 excluding the delivery charges of $995.